This might seem controversial and may even challenge your beliefs. Being a perfectionist can be one of the most destructive habits when it comes to success. Fear of not being able to do it right stops people from ever starting. However, nothing worth doing was ever done perfectly the first time! It’s the decision to act which counts, to get going, to move in the direction you want to go, to just take that very first step! Imperfections can be fixed down the track. I once heard someone say, “Perfect is the enemy of the good.” I understand it’s a noble belief to do things ‘right’ however what’s the point in having goals if they are never achieved because they are burdened by this ‘perfection’ millstone? 2. Improve it until it’s good. 5. Polish it until it’s very good. Remember, absolutely nothing happens until you start. Top Tips: Just begin, even if what you start ends up nothing like the finished article. If you are selling to a marketplace, get something out there and then get feedback from the marketplace to perfect your product or service. 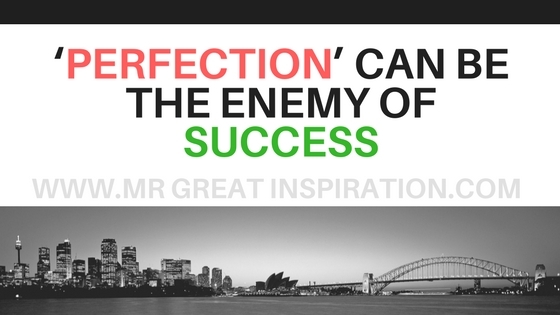 We hope guys you find our article "‘Perfection’ Can Be The Enemy Of Success" by Mr Great Inspiration useful.